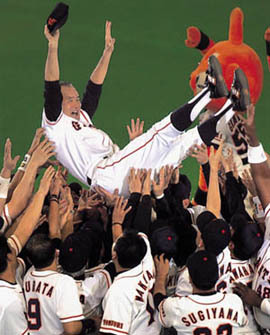 The winning professional baseball team surrounds their head coach and throws him into the air to start the celebrations. Winning would hardly be complete without a doh-age. Previous page: This young man ran in a relay race pitting university teams against each other. His team came in first, so it’s heave-ho doh-age time. Above: A student enjoying the same treatment after his friends find out he passed his university entrance exams. A fairly common sight at Japanese universities in the spring. As soon as the game is over, members of the winning team surround their manager, lift him up in unison, and then toss him high into the air, cheering loudly. On his way up, the manager smiles broadly and raises his arms above his head as a sign of victory. You'll often see this at the end of a game of professional baseball, a popular sport in Japan. These days, it's fairly common for the same thing to happen to the groom at a wedding, and to a student when people around him discover he has passed an entrance exam. This act of tossing someone in the air is called doh-age. It's an expression of exuberance, a way for a group of people to share their excitement that someone has clinched a victory or done something really impressive. Everyone in the group gathers around the person being "honored," hoists him into a horizontal position, then tosses him above their heads, maybe once, maybe 3, 5 or even 10 times. It's not clear how the custom started. According to one theory, the intent behind doh-age is to keep the feet of the person being celebrated off the ground, in honor of his "sanctity." Even today, doh-age is done at religious festivals in different parts of the country. For example, in Muika-machi, Niigata Prefecture, there's a New Year event called Muko no doh-age (toss the groom). 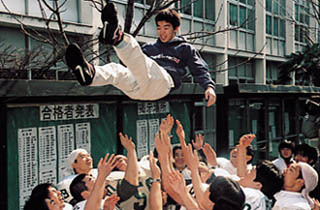 During the festival, men who got married in the past year end up being grabbed and tossed in the air. In the past, doh-age was apparently done as a practical joke, tooa 17th century novel has a scene where prison inmates "welcome" a new prisoner by throwing him up in the air, then good-naturedly let him fall to the ground. It's a unique feeling, being celebrated and tossed into the air. If you want to experience it, one way is to excel in a sport, academic endeavor or some other activity in Japan, and make sure friends you can trust are nearby when your success becomes apparent. Before you know it, you'll be in the air. They will be careful, so don't be afraid. Special Feature* Cover Interview What's Going On?